I look like Connie Booth , Sybil Fawlty. 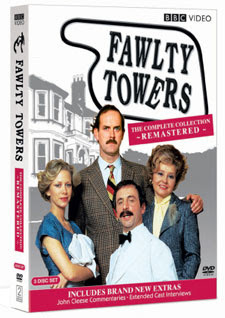 My husband LOVES faulty towers, and I've watched them all. What a great give away. If I don't win, maybe I'll buy him this for Christmas. I asked my husband and he says I most look like Polly. I think he's being nice. I don't look like any of the Fawlty Towers characters, but my husband resembles Basil (if Basil had a beard), and I'm really entering this giveaway for him - he LOVES that show! Truthfully I don't look much like any of them, but if I have to pick one it's Connie Booth, who played Polly Shearer on the show. My husband would love this! I bought him a DVD set of it online once and didn't realize it couldn't be played on our DVD player here in America! LOL! I'm not sure who I look more like, but probably Polly, since she is closer to my age. Wish I could say I looked like Sybil Fawlty, but alas do not. My friend's husband, however, could easily be Basil's doppelganger. If I had a mustache I could probably pass for Manuel. I have never seen the show (but my brother has talked alot about it) so I am not to familiar with which characters go with which names. I am going to take a stab in the dark and say I look most like Polly Shearmam. Connie Booth, on a bad day! I don't look like any of them but my brother looks like Basil. Basil Fawlty because I think John Cleese is hilarious! I'm not familiar with this, just would like to see it. While I don't look like any of the characters, as a bunbling idiot I identify most with John Cleese. Sybil, but it's a real stretch! Basil for sure. Thanks for the chance. We have been big Faulty Towers fans for years. In fact my Husband introduced me to him along with Monty Python (which I don't like). I can't say we look like anyone, but my son does a great impression of Basil Faulty. I don't really look that much like any of them, but I would say most like Polly. We love that show, good stuff! Thank you! Oh gosh - scary to say, I'd have to pick Manuel! Basil Fawlty is by far my fave ~ he is sooo crazy. I look most like Basil. I am afraid that I look like Miss Abitha Tibbs. Don't look too much like any of them but probably closest to Polly. With a fake mustache, I might be able to pull off a Manuel. Fawlty Towers is such an amazing show. Thank you for the chance to win. I think I look most like Sybil. Thanks! I really like Manuel and his love of the word "eventually". Please accept my entry. Thank you. Well... I guess I look the most like Sybil Fawlty (but in my heart, I look like Angelina Jolie!). I just became your newest curious follower! I'm Terry (then, not now). I probably look the most like Sybil Fawlty but I don't really look A LOT like any of them. I don't think I look like any of the characters, but closer to Sybil Fawlty than any of the others. I am like a Jewish John Cleese, (Basil Fawlty) with an epic-er mustache, wicked sense of humor, and not terribly handsome. There aren't many choices but I probably most closely resemble Polly. I can relate to Polly. i think i look like the major. Sybil Fawlty is my favorite, thanks! Sybil Fawlty for sure. I love this show. I consider myself to resemble Manuel, because we both seem like outsiders against modern society, well me more than him. My wife says I ACT like Basil so I'll go with that. Not quite Miss Abatha Tibbs yet. I guess closest to Sybil. Nowhere near a Polly! I'd have to say it's Sybil Fawlty. Of the regulars, I would say I look most like Sybil Fawlty, without the big hair, but sometimes I do worry I have an ingrown toenail. My hearing is a little closer to the imperious Miss Richards'. Brilliant show, that. I don't look like any of them, so i'll just say Polly Shearer.